Power-driven vessel A approaches the port side of power-driven vessel B. Vessel A is considered the give-way vessel. 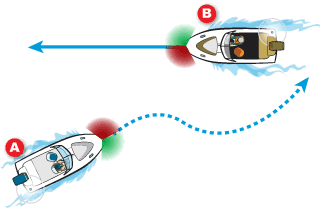 As the give-way vessel, A must take EARLY and SUBSTANTIAL action to keep clear and avoid crossing the stand-on vessel B. Vessel A must blow one short blast and alter course to starboard.. Vessel B must blow one short blast to indicate understanding, and maintain course.